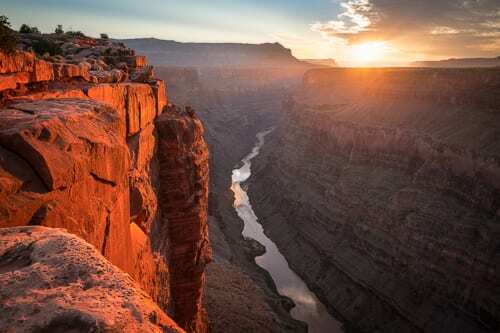 Toroweap is our favorite view of the Grand Canyon. 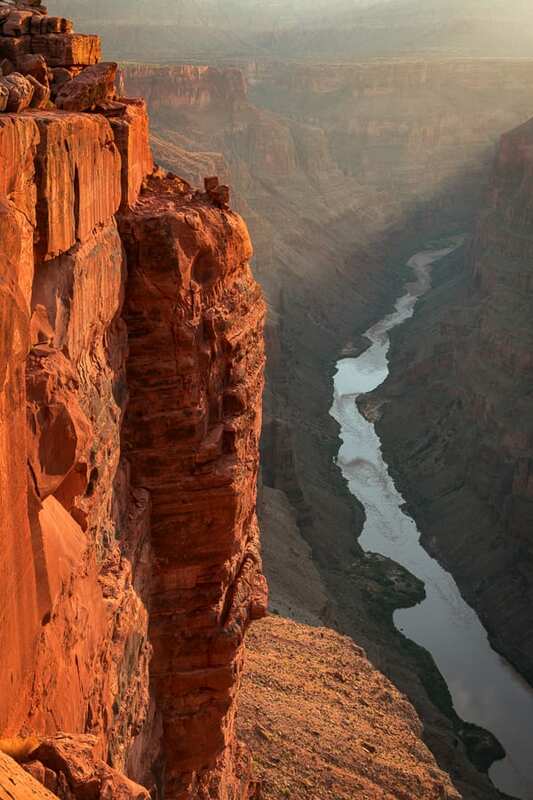 The views of the Colorado River are sublime as it winds through the deep, narrow canyon walls. Throw in a few clouds and dramatic light and you have the makings for epic photography! It's rare that we see anyone else out here. There are no railings or paved trails out here. This is how the Grand Canyon was meant to be seen! Getting here is not easy with a 60-mile drive down a rough dirt road. The last few miles require high clearance 4x4. But all that will be quickly forgotten as you gasp in awe the first time you look over the rim! On our way, we stop by a cave that is filled with vibrant pictographs. Even though they are a 1000 years old, they are so colorful it seems like they could have been painted yesterday. Small group capped at 5 people max. We only go for the best light (i.e. no midday tours). Overnight trips are also offered. Drive Time: Around 2 hrs each way. Tour Departure Time: Please see the time listed on your booking since the times vary throughout the year. Please arrive around 10 mins early to load your gear and finish the check-in process. The return time is approximately 8 hours after the departure time. Note that we operate on Utah time which is one hour ahead of Las Vegas. During the months of Daylight Savings (approx mid-March through early Nov), Utah is also one hour ahead of Arizona. Please take this into account if traveling from out of state. Tour Meetup Location: You will meet at our office in Kanab, UT. The address will be given in your confirmation email. This is a safe place to park your vehicle. If you like, you can leave any valuables indoors. Once you arrive, we’ll ask you to load your gear and sign a liability release waiver. Contact us if you are unable to get to the meet-up spot and we’ll make alternate arrangements. Las Vegas is the closest major airport to Kanab. There is no public transportation to Kanab, so you’ll need your own rental car or private vehicle. We recommend that you stay in a hotel in Kanab the evening of your tour. There are many good hotels in the area like Hampton Inn, Best Western, Holiday Inn Express, Comfort Inn & Suites, and the Canyons Botique. 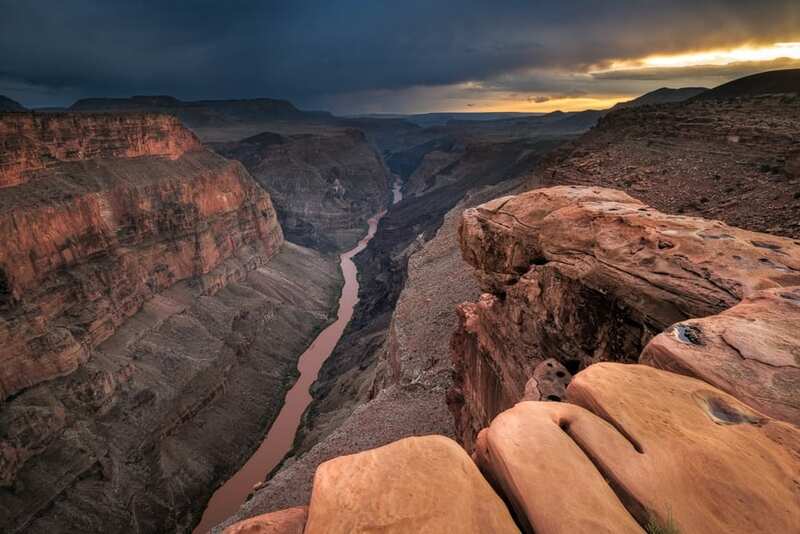 Permits: We hold commercial use permits for Toroweap and the Grand Canyon. If staying overnight, a backcountry camping permit is required. Contact us for details. Road Conditions: The road to Toroweap is long and rough with the last few miles requiring high clearance 4x4. If it has been raining or snowing, the road may not be passable due to mud. Should that be the case, we will let you know as soon as possible so we can make arrangements to visit a backup destination. Weather Conditions: Toroweap is at lower elevation than the surrounding desert so it's often warmer and drier. But it can still get quite cold out here in the winter season. Make sure you dress for the weather. Bring a warm layer since it can get cold once the sun sets. 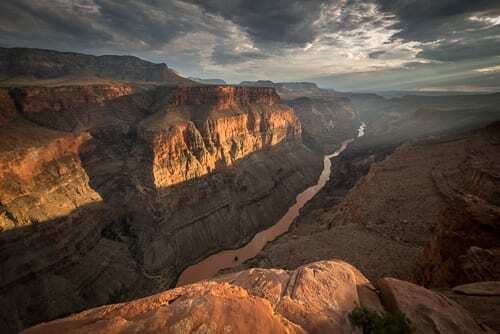 The Grand Canyon is best for photography when the weather is unsettled. We cannot offer refunds due to weather unless we cannot go out at all. Hiking / Fitness: This trip is rated easy for physical exertion. We can drive almost all the way to the rim and then it's just a short walk along the rim to various view points. 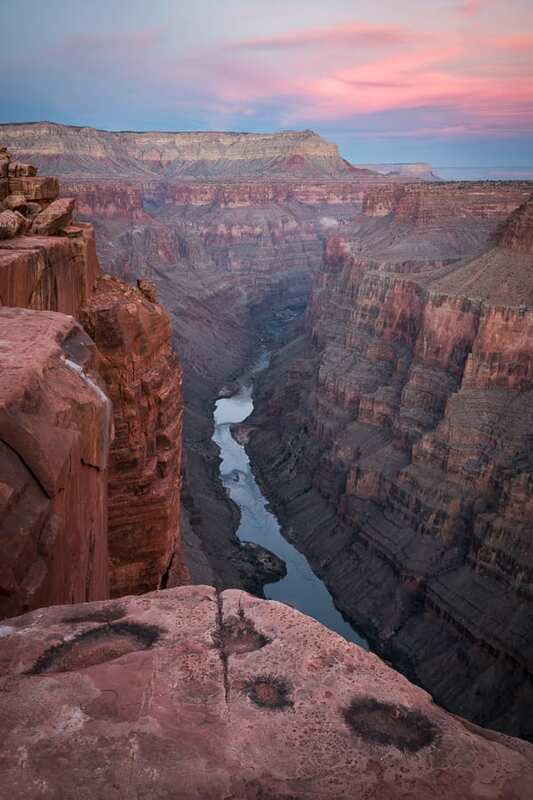 Overnight Option: Even though Toroweap is spectacular at sunset, it's even better at sunrise! 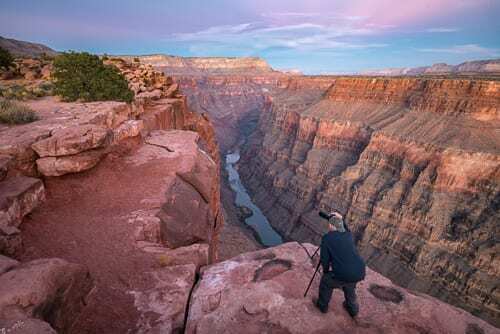 The only way to photograph Toroweap at sunrise is to camp overnight on the rim. If you are interested in arranging an overnight tour, please Contact Us. We need to know to know at least a week in advance so we can acquire the backcountry camping permit. Camping gear is available to rent if you don't have your own. Night photography is also an option when doing an overnight trip. Petroglyph Cave: As a bonus, we stop by a cave on the way that is filled with pictographs. The colors are so vibrant you'd think they were painted yesterday - not 1000 years ago! A tripod is required to photograph inside the cave. Food/Water: We do not provide food on our day trips. All participants should bring food/water to hold them through dinner. Many folks will eat their dinner during the drive from Kanab. We will have a cooler where you can store food and drink. We will provide food on overnight outings. What to Wear: You should check the weather forecast prior to coming on the trip. Toroweap is often 10 degrees warmer than Kanab. Don’t forget sunglasses and sunscreen. If rain or snow is in the forecast, bring a rain jacket. We recommend wearing sturdy footwear since we'll be traversing a lot of uneven and rugged terrain. Cell Phones: There is no cell signal at Toroweap or for most of the drive. However, bring your cell phone along! They are great for capturing candid images. There are USB ports in our vehicles so bring a charging cable if you need one. Group Size: Our groups will never exceed 5 people per guide. For those photographers that feel more independent, we will allow you to wander away from the group and explore on your own within reasonable limits. Camera Gear: You can make use of just about any lens at Toroweap. The most useful will be a wide-angle zoom lens (equivalent 16-35 on a full-frame camera or 10-22mm on a crop sensor). You should also bring a mid-range zoom lens around 24-100mm to provide nice scale and compression. Telephoto lenses will be useful for isolating distant landforms and for any wildlife opportunities we encounter. All participants should bring a tripod. For filters, a circular polarizer can come in handy when there are clouds in the sky (it’s best to avoid polarizers on cloudless days). A neutral density filter can be nice to create long exposures for fast moving clouds. Don’t forget extra batteries, memory cards, and cleaning supplies. Please contact us if you’d like to rent any camera gear for your outing.